Congratulations to Hannah seymour who has been selected to represent Northumberland and Durham at this team championships. This is a great achievement and another first for both Hannah and Morpeth. Good luck Hannah from everyone at Morpeth Click for full team details. 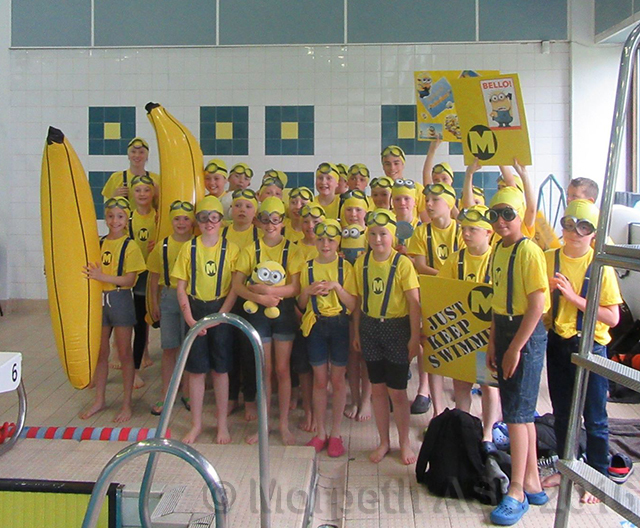 Thank you to everyone who attended the Durham Medley Challenge today, the swimmers were a cedit to Morpeth Swim Club and the parents were a fantastic support. Throughout the day we had many excellent swims with great PBs resulting in over half of our 20 swimmers reaching the IM finals. Kate Kennedy, SamTate and Niamh Atchsion made the IM final and won their age group event by over half a length. They were all presented with their gold medal and a huge trophy to reward three outstanding peformances. Other finalists were Henry Brett, Richard Butterworth, Holly Smith, Hannah Seymour, Lauren Howe, Jess Watson and Ethan Howe. Hannah won the silver in her age group with Ethan taking bronze in his age group. The final event was the IM relay where our team of eight had a combined age of no more than 90 years. 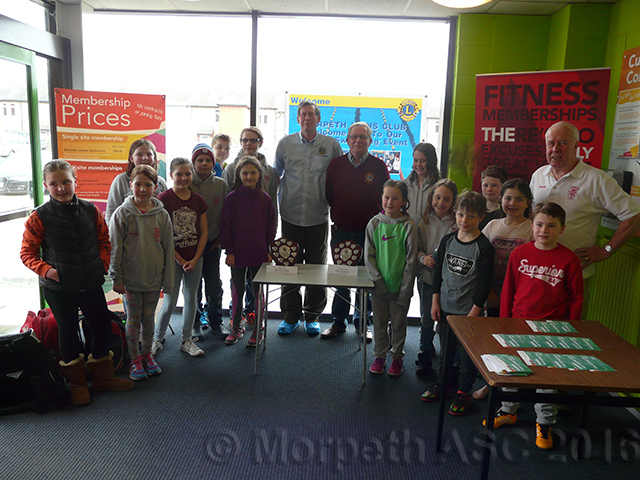 We had some young swimmers representing Morpeth and they done us proud - next year we will all be one year older and I guarantee we will be on that podium !!!! I had a great day and I am sure I can speak for Helen Seymour and Jeremy Butterworth our poolside Team Managers to say that you all swam outside your comfort zone completing events you would not even dream of entering normally and for that you should all be very proud of yourselves. 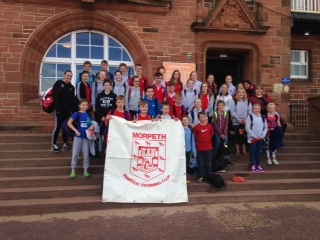 Eight MASC swimmers took part in the Northern Regional Biathlon competition this weekend in Hexham. There were outstanding performances from all our swimmers, with all apart from Kate Seymour (who was beaten by her sister) and Ross (who withdrew prior to the swim) coming first in the swim element of the swim/run event. Kate Kennedy (U10 girls) came overall 1st in her event as did William Butterworth (U11 boys), Ben Walker (U13 boys), Hannah Poutney (U15 girls) and Kate Seymour (U16 girls). Sam Tate finished in overall 4th position and Hannah Seymour finished in second position. Sadly, Ross Charlton had to withdraw due to injury but not before he impressed us all with his prowess in the laser pistol shooting demo. Kate K, Kate S, William and Hannah P gain automatic entry into the National event to be held in Crystal Palace next March. 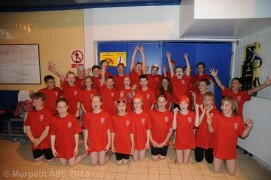 It was an awesome day support was fantastic from all the parents that traveled and the swimmers had fantastic swims. I have recently reviewed how the club will administer payment of gala's going forward. All entries need to be submitted to Lynda Garland (Gala Secretary) as normal. Once entries have been accepted by the organising club, these will be displayed on our club website. Payment must then be made for your entries. Please can you make sure that payment is made before the gala has taken place but not before entries have been accepted. Once entries have been accepted no refunds can be made. I hope this is self explanatory however please do not hesitate to contact me should you wish. Morpeth finished 5th in Diddy league final this morning. On behalf of the Club I would like to thank the Junior Committee for organising today's (saturday 11th June) coffee morning event. Also, all of the swimmers, parents and coaches who supported the events by providing cakes, raffle prizes and helping out on the day - it was great to see such a brilliant team effort. As well as all of the great baking, the clear highlight of the day was throwing wet sponges at the coaches - Ed is already planning to make this a regular activity! 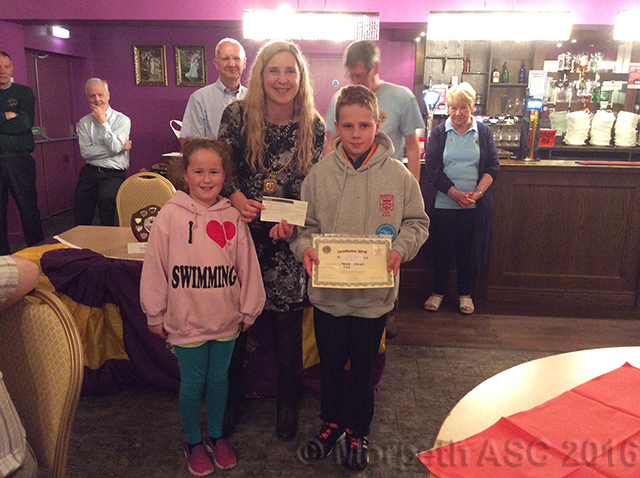 Tonight (Thursday 5th May) Ellie Henderson and Richard Butterworth two members of the Diddy league squad who took part in the Lions sponsored swim on Saturday 7 March 2016 received a cheque for £244 and certificates for each team member from the Morpeth Lions club presented by the Mayor Allison Byard. The money raised will help to pay for buses to Diddy League competitions. Congratulations to all the team members who took part. Many Thanks for all those members who attended this year’s AGM, there was some good discussions as well as appointing the new committee. The annual ‘Coaches Report’ and the ‘Chairs Annual Report’ are available below and give a good summary of all the many things we have achieved over the last year. The annual accounts were also presented by the Treasurer, any member who wants a copy can request one by email me here . 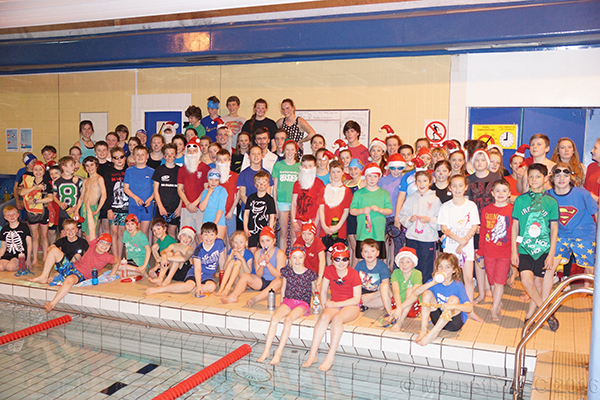 They swam a grand total of 429 lengths and raised a magnificent sum of £487. Congratulations to everyone who took part in the swim a truly remarkable performance. The money raised will go to the Morpeth Lions Club who raise money for charities. A charity Cheque will be presented to the club at a Presentation Evening which will be held on Thursday 5 May 2016 at 6.30-7-30pm at the Riverside Lodge, High Stanners, Morpeth. All team members are invited and there will be a light finger buffet and juice. It was proposed that the Cheque to be presented to the club will be used to help pay for transport costs for the Diddy League Squad. If you would like to attend please let Lyndsey know but hopefully I will see you all there. It is now time to complete a new membership form again - Sorry. The annual fee has gone up from last year, this increase has come from the ASA and this has and always has been set by the ASA. As a swimming club we must be registered with the ASA, to run and allow swimmers to be competitive. All swimmers and members of the club must complete a new membership form and correct fee to be set in with completed forms. 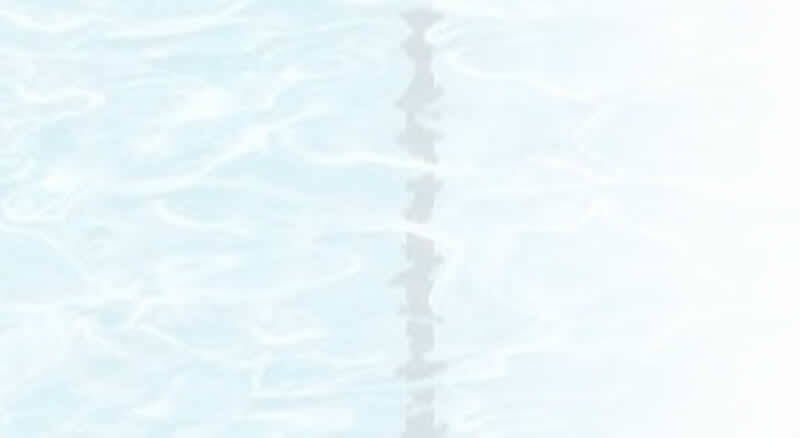 Cat 1 - £17.00 For all swimmers who are NOT a competitive swimmer. Cat 3 - £12.50 Volunteers & administration. From 20th January 2016 untill 28th February 2016. This gives everyone 5 weeks to complete, return and make payment. You can open the file and complete on your computer then print off to be handed in. This does eliminate many handwritting errors. If you are unsure about which category is assigned to you, I will be happy to help. The votes by swimmers regarding a name change were counted up last week and the result showed that the majority of those voted in favour of keeping the current squad names rather than go back to the 'fish theme'. Morpeth ASC coach Sylvia Bland and her friend Jane Hardy are both open water swimmers and swim year round in the Northumberland seas without wetsuits. Over the years their passion to find new adventures has taken them on many exciting swims from an English Channel attempt to swimming from Robin Island to the main land of South Africa in shark infested waters. These events have made the girls well known in the swimming fraternity so they were very excited when a few weeks ago they were invited to attend the World Winter Swimming Championships in Tyumen Siberia. The outside temperature will be around - 30'C. Chainsaws are used to cut a pool into the frozen river. Where despite the water temperature being below zero it is a lot warmer in the water than out!! The girls are training regularly in the sea and even in an enormous puddle in a farmers field. They also use an old bath in the garden each day to practice getting into iced water. Why? Believe it or not they enjoy it. However, Jane is a volunteer medic for the British Divers Marine Life Rescue. She is on call 24 hours a day 365 days a year. Both girls love the ocean and the wildlife which thrive on it. Preserving the wildlife is a great passion to them for the future of our children's children. Therefore they hope to raise funds for the BDMLR. Their just giving page had more information and pictures . If you would like to donate then please follow the link below. 1) Land Training was well received. There was a minimum of 21 swimmers at each session. It was a trial but there is appetite amongst swimmers for more. In the meantime I have created a 2 sided sheet incorporating all exercises swimmers did on the mornings. Swimmers have been using the land training laminated cards on poolside and before session in the last week. Please print off your own copy and ensure you give yourself time to complete this warm up before getting into pool where possible. I will always have a supply of laminated cards and Derek has some for morning sessions. 2) Morpeth is a well supported club and membership is full to capacity. We have limited pool time and I ask that what you have in your individual squad is used to its full potential. If you attend the sessions please ensure you train properly and complete the session. I am seeing so often swimmers making the effort to come to the sessions but find reasons not to train. There are occasions when this will be for unavoidable reasons and I understand that, however I see a pattern with certain swimmers. I will now be monitoring this both mornings and nights and if need be I will be asking you to leave the session if you are disrupting the other swimmers in the lane by not listening or completing the session. 3) The equipment pegs are now in place on poolside. From Monday 23rd November all kits bags will be left on these pegs which are in the alcove in the deep end. The pegs are on 2 levels all AB, AA and A will place their bags on the top pegs and B and development will place their bags on the bottom set of pegs. As always any questions please catch me on poolside. Also well done to all swimmers for performances yesterday especially to Jess Watson and Niamh Atchison who broke club records. Lastly well done to Lauren Howe, Hannah Seymour and James Wells who made it to Regionals this weekend. Hannah won silver in the 100 back and Lauren won bronze in the 50 back. PBs all round. Congratulations go to our overall 2015 Swimmer of the Year Hannah Seymour. Also congratulations to our Squad Swimmers of the Year Ben Hewitt (Development), Katherine Rowell (B Squad), Fay Smith (A squad), Lauren Howe and James Wells (AA Squad) and William Pallett (AB Squad).